Given that I have already crushed my January, February and March writing goals, it’s clear to me now that finding the right words is no longer my problem. In fact, I’m starting to work in the other direction. It can be hard to edit your own work, at least for me. I typically fall in love with the way I phrased a sentence or set a scene. But I have taken some pleasure the last few days out of deleting words, sentences, paragraphs (okay, I never delete entire paragraphs but I do rework them) and improving the flow of my story. I contacted the instructor of the writing class that started this whole “I’m going to write a novel” craziness. She is not only a published author but also a professional manuscript editor. So the new goal is to get her my completed work by March 1st. This deadline feels more pressing than my noting the daily word count on a calendar. It means I’m taking the next step toward publishing my work. But… before I get to that point, I need a few volunteers. Much like I straighten up the house before the cleaning lady comes, I want my draft to be as perfect as can be before placing it in the hands of a professional. I’m looking for readers. The qualifications are: you like to read; you have a good sense of story; you aren’t afraid to tell something doesn’t work; and you have time. I’ve divided my story into three main parts, so I’m not asking any one person to read the entire story. Each section is between 75-125 pages. I’m hoping to recruit six volunteers. I will need comments/edits by February 15th. Email me directly if you are interested. (Sorry, strangers, this offer is limited to people I know.) If you live locally, I will reward you with a wine night. Okay, now that I’ve found my higher purpose, blah, blah, blah, it’s time to achieve it. I have become one of those people who measures document length by word count, not pages. It finally makes sense to my brain. I think back to all the college papers where I used a large font size and wide margins in order to meet a certain page-based length requirement. Word counts can’t be manipulated. Well, I guess you could add bunch of superfluous words but that’s not my point. So while apparently the answer to “how long should a novel be?” is “as long as it needs to be” the research I have done yielded the answer: 80,000-100,000 words for my genre. After my intention setting classes, I decided to set a word count goal for my novel. I started New Year’s Day with approximately 40,000 words. The January goal is to get to 53,000. 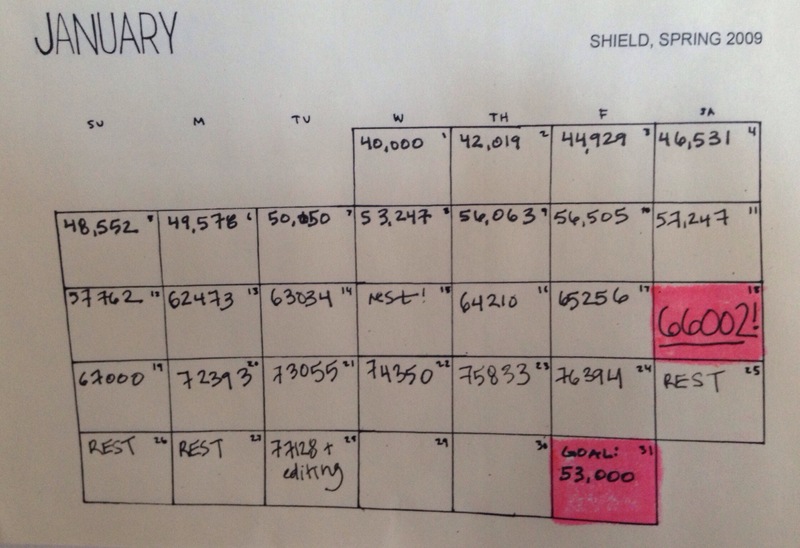 The February goal is to reach 66,000 and by the end of March, 80,000. From there I’ll assess whether the story is complete and then undertake the review and editing process. The point is to get the words out of my head and on paper. As of tonight, I’ve written 56,500 words. I crushed the January goal. By the time I get to February, I might have to recalibrate the goals. There’s a higher purpose but there’s also a process. I might be making it up along the way but at least I’m on the road. This week, to bolster my chances of keeping the goals/resolutions I set for myself, I attended two yoga intention setting workshops. 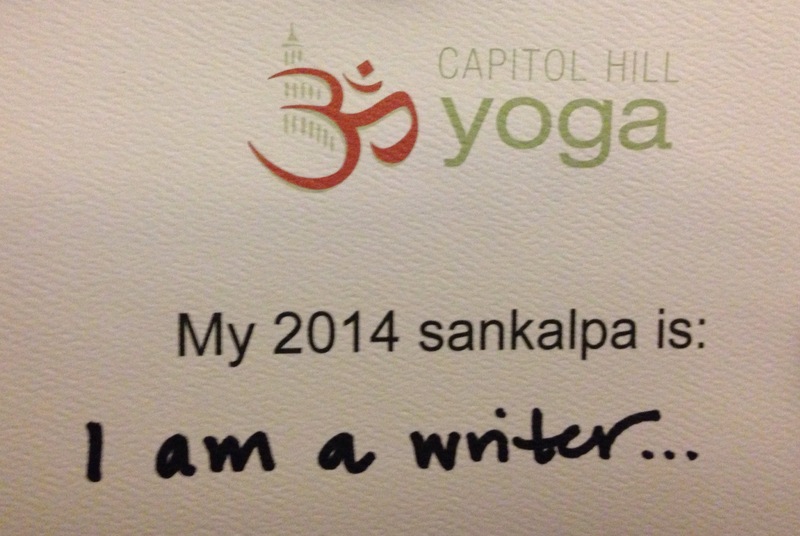 The first workshop was held at Capitol Hill Yoga on New Year’s Day. I had no idea what to expect. I went in thinking, “drink less bottled water, be more outwardly and innerly graceful, finish writing my novel.” I came out with my higher purpose. It didn’t take but a millisecond for me to realize my sankalpa. While the action required to achieve it is the goal I went into the session with (to finish writing my novel) my sankalpa is: I am a writer. Once it was clear, I felt energized. I did an hour of hot yoga to seal the deal and came out eager to get to my computer. I’ve barely left its side since then, clocking about 6,000 words (and hours of editing) over the last few days. Not that they’re all quality words, but in the moment I’m all about quantitative progress. I almost canceled workshop number two, held at Flow Yoga Center. When you know your higher purpose, you know your higher purpose, right? However, teacher April Puciata’s workshop was also valuable in helping me root my sankalpa. Her session actually felt like a continuation of the first workshop. She walked us through a deep meditation from which I emerged with my sankalpa firmly planted in my core. I am a writer. I am a writer. I am a writer. And I got a little nap in too.